Most animal lovers know it’s not safe to leave a pet in the car during the summer. When it’s 80 degrees outside, the temperature inside a car can reach 99 degrees in just 10 minutes, according to the Humane Society of the United States — and leaving windows cracked doesn’t do much to help. There are, however, many more local ordinances that prohibit such actions, and the situation could be considered cruelty in some circumstances. We talked to experts at the Humane Society and the ASPCA to get tips on what you can do to help a pet left alone in a hot car. Gather pertinent information: Make a note of the car’s make, model and license plate number. Attempt to locate the owner: If there are businesses close by, notify managers or security guards and ask them to make an announcement to find the car’s owner. Call for help: Both the Humane Society and ASPCA recommend calling animal control. The Humane Society also suggests that you call the nonemergency number for the local police, while the ASPCA recommends calling 911. It’s a good idea to have those numbers programmed into your phone or to keep them in your car’s glove compartment. No matter whom you call for assistance, stay with the vehicle until help arrives. 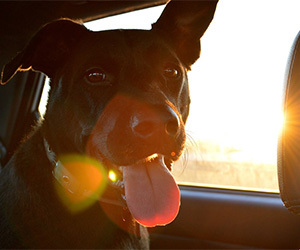 Educate pet owners: The situation might be avoided if more people understood the danger of leaving a pet in a hot car. The Humane Society and ASPCA both have flyers that you can print and ask business owners to post in their stores or restaurants. Although your dog might love to go for a ride, the safest thing to do when it’s warm outside is to leave him home, where he will be comfortable. “The tragedy of losing a beloved pet in a parked car is that it’s one of the more preventable forms of animal suffering; all we need to do is put our pets’ well-being before our own desire to have them along for company,” says KC Theisen, director of pet care issues for The Humane Society.